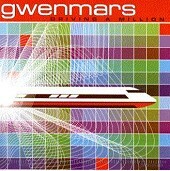 Brit-pop by way of Los Angeles, Gwen Mars gives bands like Blur and Oasis a run for their money, though Gwen Mars does it with more guitars, more volume, and more punch. Not to mention more pop hooks. Driving A Million is a power-pop album in every sense of the word, ran through Brit-pop influences and an indie rock structure to boot. "Neon Tom," the album's lead track, is a hook-laden, charged rocker that starts this album off right. "She Hung the Moon" is brings in some slight psychedelic influences, reminding you of The Dandy Warhols, another West Coast-based Brit-pop act. Then there is "Venus," a song made for modern rock radio. Snappy hooks, rocket-paced rhythms, and as energetic as they come, this sweaty rocker has the bounce, stamina, and kick to really drive fans and non fans alike wild. "Train Song," another album highlight, keeps the band's agenda in check: lots of volume and power, big, bass rhythms, guitars coming from everywhere, and hook after hook ready to knock you out. Driving A Million is a monumental album. It blends the best of two worlds, American power-pop and hard rockin' Brit-pop. Front man Mike Thrasher's lyrics can be clever at times, while other times they're generic. However, the melodies and rhythms the band creates are always crisp and jaw dropping. I'll give this an A.